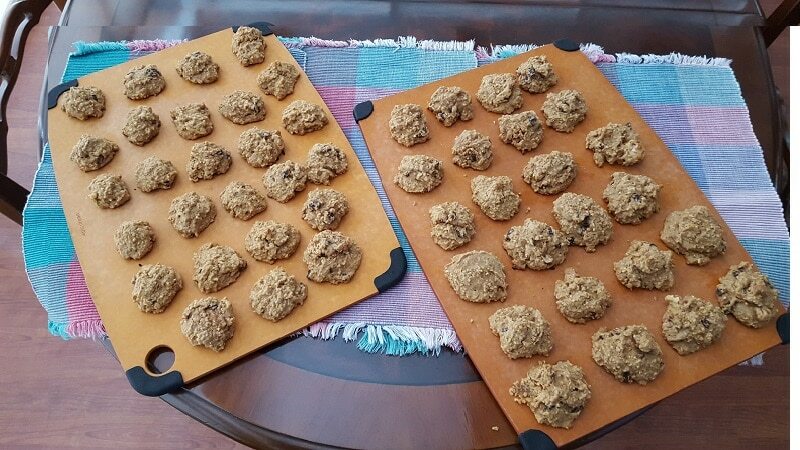 I’m sharing my version of Vanishing (Steel Cut) Oatmeal Cookies recipe. 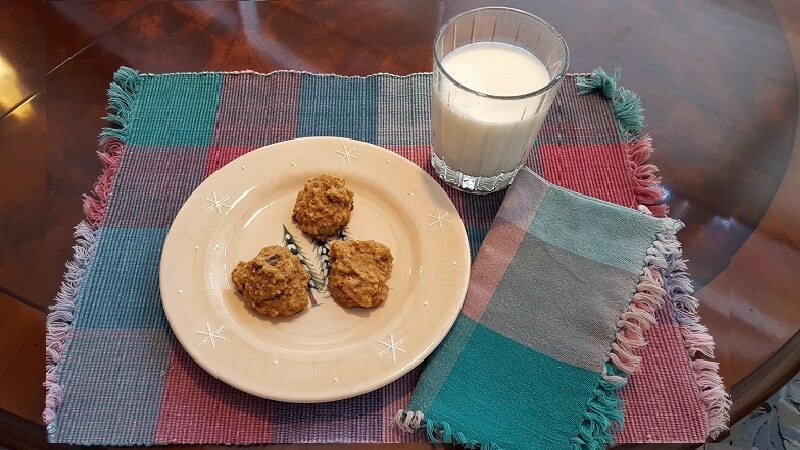 After the year end holidays with all the seasonal cakes, cookies and desserts, this cookie recipe is an easy one that you can feel good about making for your family. 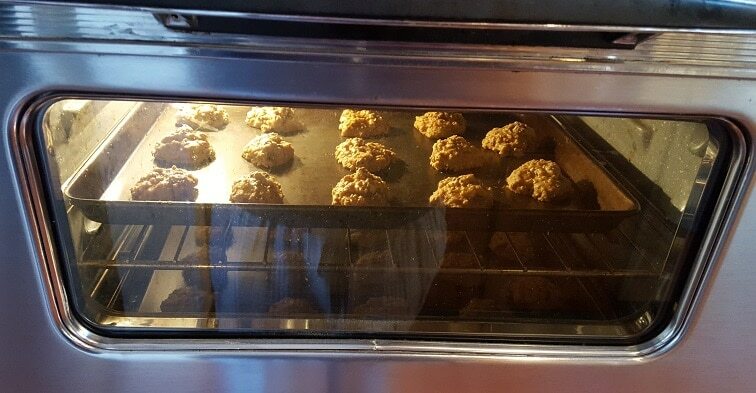 Quaker Oats Vanishing Oatmeal Raisin cookie recipe is a classic, and there are so many variations online. I made this batch with steel cut oatmeal. 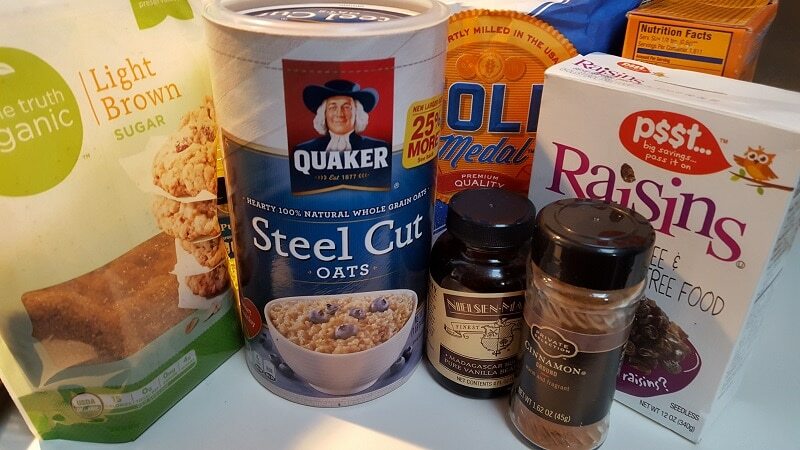 Steel cut oats are rich in soluble dietary fiber, with a 1/4-cup serving containing 2 grams, and providing 15 percent of the recommended daily allowance of fiber. 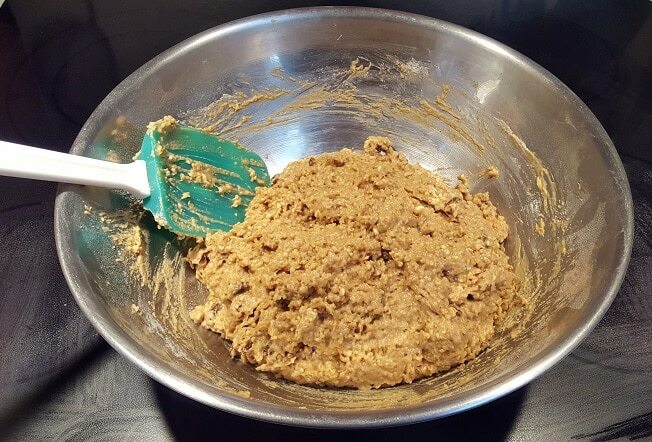 To prepare it for my version of this cookie recipe, I covered the steel cut oats with boiling water, stirred in the raisins and set it aside while I gathered all the other ingredients. I also added walnuts to my recipe. Other than using steel cut oats, and walnuts, mine is pretty close the Quaker Oats recipe. It’s always important to set up your mise en place. 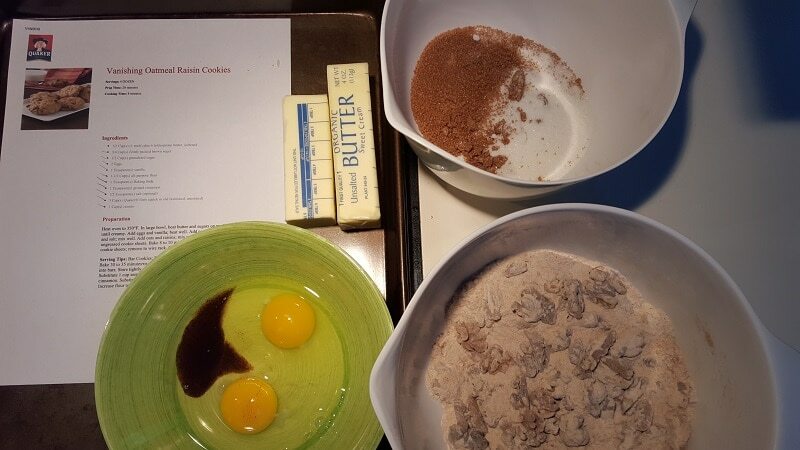 Here you see my butter, eggs, vanilla, white and brown sugar, flour, baking soda, salt and walnuts. I added a bit more flour until the dough was the consistency I wanted. You just drop the dough by the spoonful onto a ungreased cookie tray and bake for 8-10 minutes in a pre-heated 350 degree oven. Try NOT to do that! Keep them the same size so they will bake evenly. 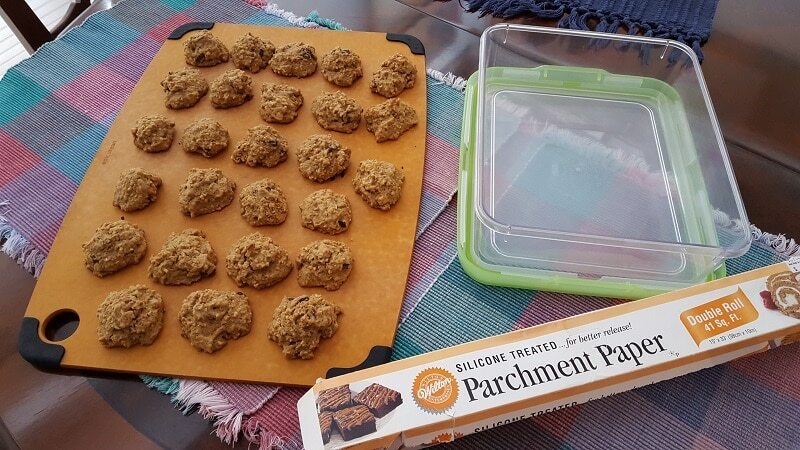 To keep them moist I place them in a container and line the rows with parchment paper. Why didn’t the recipe address the water in the oats? I only used the recipe card on the bottom and declined to read the story about making the cookies. So my cookies are terrible, the oatmeal is gritty, now I have 4 dozen useless cookies. Please put ALL of the information in the recipe card and directions. It is always a good idea to read through any new recipe a couple of times before beginning. I learned that while working as an assistant at a cooking school, and it has been very helpful to me. I wish you good luck! I just found your recipe and see you have had problems keeping the cookies the same size. I used to have that problem when I got tired of scooping until I invested in a good cookie scoop. Now they are all the same size and cook the same. I have 3 different sizes. A small one for little cookies and small meatballs, a medium one for regular cookies and a larger one for perfect sized muffins and cupcakes. Give it a try. Great idea, Laura. Are they like ice cream scoops? Yes. You can get them all sizes. I don’t like scooping ice cream with them, since hard ice cream tends to mess with the thumb-driven clearing mechanism. But for cookie dough, they work great. So I don’t like to think of them as ice cream scoops. I think I understand the watery cookie dough dilemma. You said to soak them. But you never said what happens to the extra water after they’ve soaked. Are you leaving out a step? Perhaps the one where you drain the oats before adding them to the recipe? TY for your question! If you follow the print recipe at the bottom of the post, you’ll see it doesn’t call for steel cut oats. So using quick or old fashioned oats should eliminate any confusion. 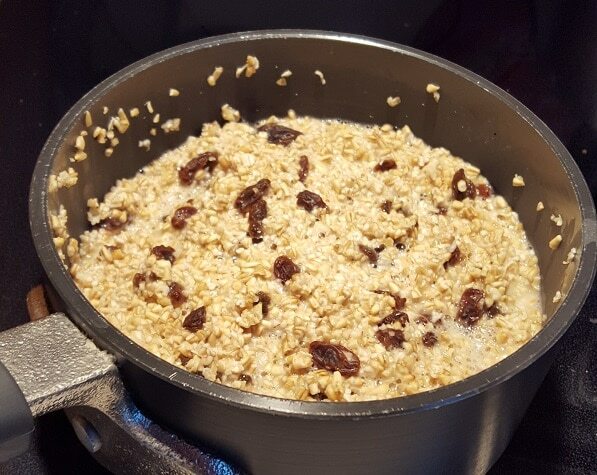 If you want to try with steel cut oats, add just enough boiling water to cover them, no more, when you set it aside the oats and raisins should soak all the moisture up. I wish you’d include all measurements. i.e. the amount of water to cover the oats and the amount of walnuts you used. I’m not a big cook/baker, so unsure. Thx. Stir in 1 cup chopped nuts. If you use 3 cups of steal cut oats then you should put them in the pan and cover them with boiling water. If you use Quaker® Oats, you don’t need to cover them with water. You can find the recipe here: http://www.quakeroats.com/cooking-and-recipe/vanishing-oatmeal-raisin-cookies.aspx Hope that helps. How much dry steel cut and how much water? 3 cups, covered with boiling water. If you do that first, and then gather and measure the other ingredients, that should be enough time to make them soft. You can print the recipe at the bottom of the post. All the measurements are there. Good Luck! Let me know how they turn out. Thanks for the recipe! I made them without any issue. In my last 2 batches I added some chocolate chips! Delish!!! Wonderful! Thanks for sharing your success. PS our daughter and grandkids just got back from a week in Thesaloniki. My son in law, Yiani, grew up there. That’s great! Happy New Year! Something here went terribly awry. I used steel cut oats but they watered down the recipe and towards the end i just had a really wet bowl of cookie cough, that would in no way hold shape or form. I added two additional cups of flour and it was still soupy. I’m so sorry to hear that. Did you cover the steel cut oats with boiling water and set them aside until the water was absorbed? Like in the photo? I’m sorry if that wasn’t clear in the recipe. I love oatmeal cookies. I like that you used steel cut oats. Gives the cookies more texture. I laughed when I read about your cookies getting larger. Mine have a tendency to do that,too. Delicious. But why are they disappearing so quickly? Hmm. Wonder if there is a connection. Positive feedback. Husband. Official taste tester. Hmm. Wonder if there is a connection?